Marketing and advertising have become essential promotion tools to acquire new clients both on the national and international markets. Each year important budget items are allocated to this department with the aim of fostering the clients’ loyalty and increasing sales. The importance these texts have must reflect as well in their translations. They are documents which show the corporate image and convey the company’s values. They represent your business card, and often the first impression is what the client will retain. All details must be taken care of, whereas the text must never play a minor role. Words also sell. 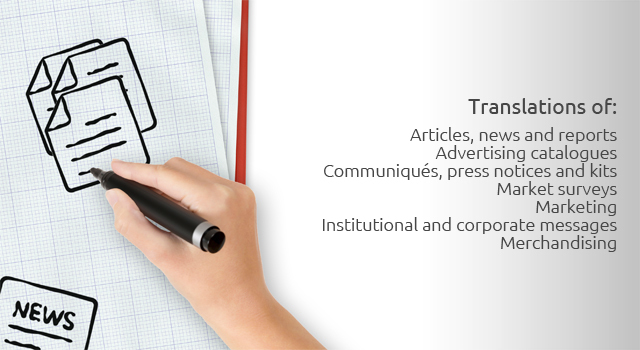 At Planet Lingua, more than a decade of industry experience supports us, and a great deal of companies of different sizes and areas entrust us with all their translations of communiqués and press releases, billboards and advertising catalogues, marketing campaigns, merchandising and articles, among others. If the original text contains significant language errors, the corporate image is seriously damaged and may stop a great launching campaign. In order to save the company costs, we offer the service of reviewing original texts. Thus, we ensure an impeccable original text, as well as a great translation.